花花 (Hua Hua, which means “flower”) was with a friend (who will star a near post) in Songshan Cultural Park, where the Chanel’s exhibition “The little black jacket” was taking place. She was wearing a black T-shirt, mustard wide pants tied at the waist and tight to the ankle, and black sandals with platform. 花花’s complements were a silver necklace, some bracelets and rings, and a beautiful black leather purse from Vivienne Westwood. Aw you look gorgeous! Love the colour of those trousers. 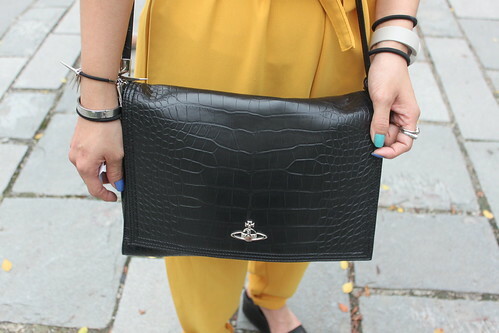 Great bag too… you have good taste! Love the mustard pants, they are so cute and fun!